I am not the most experienced birder around, but I have been birding for a long time. I will share what I know, and on occasion ask more experienced birders for advice. This was a page for questions and answers. *****I no longer take questions on this page, but if you do have a question please go to my Facebook page, and message me. ***** There are some interesting questions here, but I find a lot of people prefer a private answer. Also I don't like to publish questions with identifying information for safety's sake. Also I do not give specific locations for certain birds like owls, hawks, or eagles because they are often harassed. Question: Where can I buy bird feeders and bird food in Orange County? Answer: Some bird feeders and wild bird food can be found in regular pet stores like Petsmart, Petco, and others. Target, Walmart, feed stores, and even some grocery stores. The best selection that I have seen can be found in Wildbird Unlimited. They have locations all over Orange County and the United States. Question: Should I feed the ducks and geese in the park? Answer: Short answer is no. The reason being that in the park lots and lots of people feed the ducks. It is just too much food. Parks end up with too many birds in one place that simply hasn't got enough food to sustain them. Fouled water from decaying food and too many birds results in algae growth and illness. Plus people feed ducks and geese the wrong kind of food. Breads like sandwich bread, tortillas, bagels, sweets and snacks like donuts, chips, and the like are processed foods that are not nutritious. The birds like those foods--just like you and I would--but it is no better for them than it is for us or our children. Many counties and cities have laws against feeding the birds for just those reasons. For more information, see my posts on Odd Ducks and Carr Park. Please note that feeding squirrels in the park is also prohibited in many parks and is not advisable due to the huge increase in population caused by feeding which can severely affect the delicate balance of nature. Also squirrels that are fed lose their fear of people and can become aggressive. Question: What is the best way to learn about birds in Orange County? 2) Join Sea and Sage Audubon or a chapter near you. Sea and Sage has classes, field trips, and lots of people willing to share their knowledge with you. You can't beat it. Question: I have a question ...would like to correspond with you directly. Would it be possible for me to get a direct email address for you? Since they manage a lot of nature areas, they often have a lot of good information regarding wildlife. The premier University program about birds. Located in New York, but you can reach them through their website. Focuses on birds of prey. Wildlife rescue in south Orange County. Nature Center in Huntington Beach. Wildlife Sanctuary run by Sea and Sage in Irvine. The local Audubon Society in Central and Northern Orange County. The only Orange County Audubon on the web. Wildlife rescue in Huntington Beach. Hope this is of help. If you wish to ask a confidential question, I would be happy to publish the answer. Question: What happened to the water level in Huntington and Talbert Lakes at Huntington Central Park? Answer: This is a question I get a lot. In fact, I wondered myself when last year, the water level in all the lakes and ponds at Central Park in Huntington Beach suddenly dropped. "Like someone pulled the plug" one of the docents at Shipley Nature Center said when I asked about it. The answer is in two parts and the parts are related. All the bodies of water in Huntington Central Park are fed by run off from the neighborhood that then sinks into the ground. Whether or not there is water in the park's ponds and lakes there depends on how high the water table is in the aqua filter below the park. During a drought the water level drops, consequently lakes and ponds disappear with only a muddy spot left to mark the spot. However, last year there was suddenly a lot of water even during the drought. But then suddenly as the docent said, the water level dropped "like someone pulled the plug." In a way, someone did. The water district can store water in aqua filters in the area, and last year it did just that in Huntington Central Park. But then the drought got worse and the water district came to get their water. What park goers saw when the water district took their water back was the sudden disappearance of the water in Huntington Central Park. So straight from a docent at Shipley Nature Center in Huntington Central Park, those are the facts behind the strange disappearance of the lakes and ponds in the park. I live in Yorba Linda -- a small black and white bird with very long tail and shreeking call showed up about a month ago --chased all of the backyard birds away -- Doves, Finches even the Crows?? Does anyone know what it is? I have searched the web and books and no luck in identifying this bird. To say it is agressive is an understatement. Kary, well, there are a few possibilities. A birder always starts with questions, and like a good birder, you asked yourself some good questions. Appearance: It is black and white. It has a long tail. Size: It is small. Sounds: And it makes a loud, unpleasant noise. Behavior: Aggressive. That's a good start. I would also ask myself, "What kind of bill does it have?" "What habitat did I see it in?" In your case, what kind of plants, trees, and shrubs are near and in my backyard. "What does it eat?" "Is it smaller than a finch? As big as a Dove?"" "Does it feed on the ground? Hover? hop through the trees?" I would try to guess a family of birds it reminds you of--like finches or warblers, or wrens. Sometimes you might be able to guess a family, but not the species. I am going to make a few suggestions and check to see if they match what you see. 1) Although, its tail is not that long, a Loggerhead Shrike acts very much like described and sounds about as you describe. A Nothern Shrike is a bit bigger with a longer tail, but it would be extremely rare to see one here--especially at this time of year. A bird that has a nest might appear aggressive--even though that is not generally its behavior. 2) Although it is mostly gray, a mockingbird has black-and-white, a long tail, and is very aggressive. They can have loud, unpleasant voices. If neither of those match, write me back and let us know what your backyard is like, what the bill is like, where the is black, and where it is white. Is it bigger than a sparrow and smaller than a Dove? Color of the bill. What kind of bird does it seem like? Perhaps we all can sort it out together. This came in on my Index page, but is such a good question that I am posting it here as well. 1) Noise--the amount of birds attracted to the neighbor's yard is causing enough noise to be disturbing to him/her. Maybe it wakes them up or their baby or makes it hard for them to concentrate. Maybe it stresses them out. 2) Maybe the numerous birds attracted by feeding approach or leave your yard through his/her yard leaving bird poop, feathers, and doing annoying things in their yard. 3) Perhaps they are afraid of diseases like Nile Virus or Bird Flu. 4) Perhaps they are concerned about other pests like rodents or opposums that might be attracted by your bird food. 5) Something I cannot even imagine. In your case. most likely it is the amount of birds attracted that caused him to notice your bird feeders in the first place. The noise and the birds coming in and out. I would follow the recommendations I gave and see if you can reduce the problem while enjoying feeding the birds. Hope that helps. Have fun feeding and watching the birds! This morning I found in my backyard a rare bird that I have never seen before. It seemed to be hurt because it did not try to run away from my dog. So before my dog ate it I picked it up and put it in a safe place. To me it resembles a kiwi bird but without the long skinny beak but has the long skinny legs. Anyway, do you know of any place that I can take the bird to in order to get care? The vet I took it to had no clue. He said it’s a wild bird and that it’s best to let them go to fend for themselves. I am at a loss because that’s not what I want to do. If you can help I would appreciate any assistance to head me in the right direction- By the way I live in Fullerton, Ca if that helps you in anyway determine what kind of bird this may be. Thanks. Also helpful is The Wetlands and Wildlife Care Center on PCH and Newland in Huntington Beach http://www.wwccoc.org/ 714 374 5587 can also help you. Good Luck. I did want to add that in speaking to a staff member at a wildlife preserve, she brought up an interesting point. Many of the rules at a wildlife preserve are broken by people who are neighbors of the preserve. They have, she said, a feeling that the preserve is an extension of their backyard and therefore somehow theirs. A kind of entitlement that says the rules don't apply to me. I myself encountered such an attitude one time when politely confronting a young woman violating the rules at a preserve. She flew into a semi-controlled tizzy and informed me that she had lived "here forever" and thereby was entitled to do as she pleased in the preserve. Two things will change such an attitude. Wildlife area management making a real effort to educate their neighbors about the preserve and its wildlife, and of course con$equence$ to bad behavior. Fines are just as real for the neighbors of preserves as they are for visitors. I live in the HH area and would love a detailed book to identify the birds I see. Do you have a suggestion? Hello Birder Girl ... Sorry, really isn't a question but instead, it's an observation from Alberta, Canada. My wife is in Californatio (Orange County) on a visit right now and I'm left at home caring for the dog. We share a dog house. Wish I was there. I've been going to your area of the world for a number of years and especially love the break from winter to see SO MANY wonderful birds. If only I had know about your BLOG in the past. You are offering such great information, some of which I have figured out over the years through trial and error on my visits. You are a gem. You deserve a medal for your willingness to help others and share your passion for birding. I will consult you often in the future. OK .. a question ... Is Bolsa Chica singularily the best birding spot in Orange County now that the rehab is well underway? Bolsa Chica is definitely a birding hotspot. The renovations have transformed it. It is bigger and better. Is it the best? Well, it depends. 1) Easy Access. It is easy to walk here--trails are covered with gravel and pretty flat. Even the observation points are not that steep. 2) It is open. It is easy to see birds in the water from the bridge and from the trails. Up on the mesa it is a bit more difficult along the PCH side to see the land birds, but still not that bad. Not only that but if you are concerned about safety, you can see someone coming from a long way off. And so can everyone else. 3) There are birds there all year. 4) Shore birds are usually easy to spot and id. 5) The variety of birds from shorebirds to raptors to sparrows is very good. What's not so good about Bolsa Chica? 1) Lots of people. There are walks most weekends and there are people here walking and jogging. A nice nature area away from the maddening crowd it ain't. Come early like about 7:30AM-8:00AM to avoid the weekend crowds or during the week. 2) Parking can be a problem. There isn't much of it. Early on the weekends or coming during the week is better. 3) The sounds of PCH are loud. You can block them out of your mind if you try, but if you take video, it will be on the video. So when I am in the mood for easy birding and shore birds and water birds, I go to Bolsa Chica. It's also near my house, so that is a bonus. But I also like Upper Newport Bay--which suffers from many of the issues of Bolsa Chica, but it has a bit more of a back area away from the crowds and it has an very good interpretive center. And San Joaquin Wildlife Sanctuary which is more natural--as natural as it gets with man-made duck ponds. All three provide great shorebird, water bird birding as well as some land birds. The Audubon House is there and they are willing to help you--including loaning binoculars. Take a map. Trust me, you don't want to start down the trail without it. If I want to see woods, then I go elsewhere. A favorite places is Irvine Regional Park which is great for woodpeckers, bluebirds, warblers, woodducks, ring-necked ducks, owls, and rare birds. It is an oak woodlands area. Santiago Oaks is also a great place. Oak woodlands as well. Trails and streams, but not much else but you and the wildlife. Look out for the mountain lions. Keep an eye out for the deer. Santiago Oaks has burned a few times, so it is a little scared, but is a very natural place with lots of land birds. 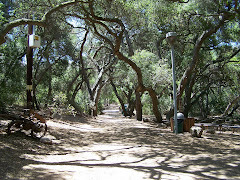 For a short stop, Oak Canyon Nature Center in the Anaheim Hills is fun. Also look out for the mountain lions and coyotes there. It is resting against the housing tracts, but it connects to wild areas and there is a lot of wildlife that goes through there. Lots of hawks, woodpeckers, hummingbirds and well, you name it. Lots of streams and oak trees. 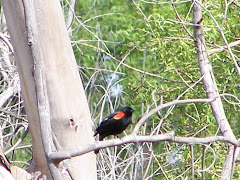 Mason Regional Park has lots of interesting birds in its man-made lake and a terrific bluebird trail. Scattered trees. Woodpeckers, hummingbirds, Peter's Canyon Regional Park is a place I mean to get to soon. I hear it is terrific and very natural. It connects up to some wild areas, too. Very good Spring birding area. Crystal Cove State Park is amazing just for scope of habitat and types of birds. It covers a huge area. It includes sandy and rocky beach and back-country hills. It is a beautiful place. Hiking the back country can be challenging but rewarding. The beach is easy to bird. The back country can't be beat for raptors. And I almost forgot another crown jewel of Orange County: Huntington Central Park. Wonderful and very large park with a nature center in the middle. Lots of birds here. Lots of warblers in the Spring. Owls, herons, egrets, ducks, hawks, owls, and lots of other birds. It is a great place to bird. And there are places I haven't even explored yet. There is an embarrassment of birding riches in Orange County. I can't play favorites. It is like choosing between good barbeque, lemon meringue pie, and chocolate. I just can't choose. "I live in the HH area and would love a detailed book to identify the birds I see. Do you have a suggestion?" I am assuming the the HH area is Huntington Harbor near Huntington Beach. I recommend the same books for Huntington Harbor that I recommend for all of Orange County. If you page up, you will see my list of birding field guides. They would cover all the birds in the Huntington Harbor area. Again, my apologies for my tardy response. Thanks to my Northern Friend in Birding for all your kind words. 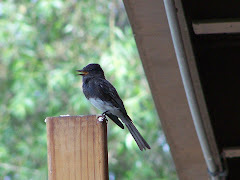 I love doing this blog and sharing my love for birds and birding. Hope your wife is enjoying the OC. Thanks again. Attracting Western Bluebirds takes the right habitat, the right nesting boxes, the right height, and timing. Although your nesting boxes are lower than the some experts recommend, they are within the limits others recommend. Also key is timing. Bluebirds start early in the year looking for a nesting location. I have seen Bluebirds pairing up already. If you put your box up late last year, that may be part of the reason. Large fields with scattered trees are great areas for Bluebirds. It sounds like you have a great habitat. If you have fruit-bearing trees and bushes nearby, you are ahead of the game. Bluebirds eat fruit in the winter and insects in nesting season. Make sure no other birds or pests like ants, wasps or bees have taken up residence in your nesting boxes. I have heard that it takes a while sometimes for Western Bluebirds to move in. Keep maintaining your nest boxes and don't give up. You may find Western Bluebirds have moved in when you least expect it. hi, i am a first-time visitor to your orange county bird blog. i would like to report that i've lived in orange county for many years and this is the very first tiem I can recall hearing bird signals from these particular birds this early in the morning (2:00am-2:30am). I am thinking that this might be a manifestation of daytime ambient noise in this particular urban area of the county causing birds to need to communicate during the night. I found a study done at the pubmed central web site: "Daytime noise predicts nocturnal singing in urban robins" (2007). I am thinking this is the same kind of thing - I was wondering if you think so. It says: "Ambient noise interferes with the propagation of acoustic signals through the environment from sender to receiver. Over the past few centuries, urbanization and the development of busy transport networks have led to dramatic increases in the levels of ambient noise with which animal acoustic communications must compete. Here we show that urban European robins Erithacus rubecula, highly territorial birds reliant on vocal communication, reduce acoustic interference by singing during the night in areas that are noisy during the day. The effect of ambient light pollution, to which nocturnal singing in urban birds is frequently attributed, is much weaker than that of daytime noise." I don't know the species of bird I hear singing. Sweet songs. Definitely not a crow. Last time I remember hearing a bird in the very early morning hours, they were really weird loud calls -- almost as if the bird has a bad cough or something. I saw what I now believe was a Great White Egret (Heron) in my neighbor's yard here in Hollywood this morning. It swooped up from their koi pond, where it's probably been feeding, and stayed on their roof for an hour or so then was gone. Although it appeared to be healthy, I've never seen any bird like this around here and wondered if this is normal. Are Egrets usually found this far away from wetlands or on their own away from others? I left a message with LA Audubon, but any info or clues you can provide in the meantime are appreciated. Great Egrets and other egrets and herons travel far afield from wetlands. Not only do Great Egrets and Great Blue Herons eat fish, but they are not too proud to eat rodents like gophers and moles. They can be found on fields, pastures, and any large grassy area as well as wetlands. Koi ponds are the icing on the cake. Any stocked lake or pond or stream can attract egrets and herons. This means parks with lakes and streams, and city reservoirs. Places such as apartments and condos with stocked streams and ponds are a big temptation as well. In and around Hollywood, there are such places as the LA River, Griffith Park, the Hollywood Reservoir, the Santa Monica Mountains, and other reservoirs, parks, clubs, and communities with small, stocked lakes. All these places attract egrets and herons, so it is no surprise that as they fly over your neighborhood, they stop and sample the koi. Hello, I live in South Orange County (Laguna Niguel). I am now taking up the hobby of feeding birds. There are a couple of birds I'd like to know what they are. 1. One bird is a little bit larger than a House Finch, is a dull brown color, and likes to forage on the ground. When he is at the feeder, I notice he scratches some of the seed off so it goes to the ground. He seems to be on the aggressive side. When I opened the door to go outside, he was nearby, jumped on a fence but didn't fly away. 2. The other bird is a cute little black and gray one. He's black on top, and seems to be gray on the underside. Flat on the head. He makes a cute little peep and flits from here to there. If you can ID these birds for me I'd appreciate it. I just taken up bird feeding and am curious on what species they are. See my post this date. Gina from Laguna Niguel again. I noticed these really tiny birds - that fly in groups, they go from tree to tree. What birds are these? Hello - we live just above Laguna Niguel Regional Park and see some hawks from time to time, which is kind of cool. (Don't know much about birds at all, but anything outside of the normal crows or doves we see is fun for us and the kids). Anyway, just in the past couple/few days we started seeing a decent-sized white bird. It "hovers" in the air while honing in on prey, then drops like a rock to grab it. Something in the back of my mind says "Falcon", but I haven't been able to find a picture of anything that looks similar yet. I do have some pictures (decent camera, but not super fast, unfortunately), in case you are interested and/or want to help me solve this mystery! (I can email them or post them on Costco.com, or something like that if you want). I saw a pair of huge scruffy chocolate-brown hawks in Huntington Central Park the week before last. In flight, their undersides reminded me of red tails - that dark leading edge of the wing and barred tail - but these birds were uniformly dark on the breast, upper parts and sides. No rufous, no white visible when perched, no red in the tail. Their calls were a bit like the Harris's hawk on whatbird.com and not at all like the typical red tail call. New to birding and a bit baffled - any ideas? Do various hawk species ever hybridize? I have what looks like a white pigeon who has been hanging out in my back yard, coming in my house and seems to want to be around people. My dog has chased it a couple times, but he persists in vacationing here now for 5 days. The patio is getting to be a mess. What is the best solution for both of us? Thank you for your question. Well, like any birds, pigeoons stay where they get shelter, water, and food. I would guess that the heat is one of the reasons the bird has sought refuge at your home, but the pigeon poop is not sanitary. So first, look around your yard and see which combination of the three needs your yard is meeting for this pigeon: food, shelter, or water? If any plants in your yard have gone to seed, prune them and clean up all seeds. If anyone in your family is feeding the pigeon, that person should stop. Wire off roosting areas if it is practical. If you have a water source the bird is utilizing, you my want to do what you can to dry it up. Puddles, leaky hoses, etc. Where is the bird resting? Sounds like on your patio. You can make the area inhospitable by buying things that make perching areas undesirable at your local hardware store. Or hanging shiny things that move, or making a lot of noise--warning your neighbors in advance: "I'm going to be banging pans." Or "I'm going to be playing obnoxious music." Traps aren't very practical: where are you going to release him or her and how long will it take the bird to fly back? Tempted to buy a fake owl? It most likely will not work. Save your money. If all else fails, you can hire someone. Search the internet for a bird control company in your area. Good luck. I hope you have one less house guest very soon. Hi, I am trying to identify a bird that i only see and hear in parks in residential areas and only at night. it is small and dark and has a very distinctive shrill cry. They are feeding mostly at night it seems and from what i can see they have a sort of hooked wing. do you know what this might be? Thank you in advance. Of the list of OC Hot Spots, which would you recommend during the first week of February if one had only 1 day in southern California? Perhaps one inland and one coastal. I am interested in coming there to photograph the wood and mandarin ducks. Is there a spring and/or fall migration time that would be best to see them? In what season are the males in full color? The Wood Ducks are native ducks and are always at Irvine Regional Park and Craig Regional Park and probably a few other parks. Fall and Winter in general are the best time to see ducks in Orange County. Many do have their breeding plumage by now (December). The Mandarin Ducks are native to Asia and harder to find here in Orange County. They are mostly escapees from collections. They have been seen at Clark Regional Park, Huntington Central Park, Irvine Regional Park, and several other parks with lakes in Orange County. However, their appearances are very sporadic. No guarantees. Best to do a search before you come on Google. Google the month and year and Mandarin Ducks and you may see where someone has just seen them. Even so, you may miss them. People don't often report them to the Rare Bird Alert because they are most likely escapees and not rarities. Now is the best time for water birds in general including ducks, herons, egrets, pelicans, and grebes. They winter here. Good luck, Tracy! The question was Of the list of OC Hot Spots, which would you recommend during the first week of February if one had only 1 day in southern California? Perhaps one inland and one coastal." Well, February is still winter. It is a hard choice, but I would recommend Bolsa Chica for the coastal and Santiago Oaks for the inland. Second choice: There is one that fits both bills--Crystal Cove. You can see some shore birds at the beach and on the rocks and if you like to hike, the back country will give you awesome views of hawks and vultures. Hi -- I have noticed, on numerous occasions, a beautiful snowy egret standing on a small hill next to Bake Parkway in Lake Forest (just south of the 241 Toll Road.) As I'm driving by heading to the freeway (going south) it is on the west-hand side. I've thought a couple of times whether I should call about it, because it doesn't seem to be near any lake and it's there so often near a busy highway. I found myself worrying about it, so I found your name by Google-ing birds in Orange County. :) It's so beautiful, and seems out of place. (I just saw a recent photo of one that had landed near the lake at Sleeping Beauty Castle in Disneyland -- a perfect place!) So my question is -- "Is this normal?" Thank you in advance! Although I would be less surprised to find a Cattle Egret or Great Egret in that type of location, Snowy Egrets also eat insects, worms, lizards, snakes, frogs, toads, and snakes which can be found in grassy areas. It is not common to find them in places like the grassy hill by Bake Parkway, but not unheard of. My guess is that there is an abundance of something on its diet on that grassy hill. With all the rain, it could be a worm, slug, and snail buffet. It is not that far from lakes and streams. They can fly quite a distance. Unless the bird appears injured, I would assume it is just taking advantage of an abundant food source. You can find out more about herons and egrets in Orange County by starting at my post http://ocbirderca.blogspot.com/2008/01/herons-and-egrets-of-orange-county.html. A pair of ducks (I think Mallard? One brown, and one with a dark blue/green/purple head) landed in our backyard. They aren't afraid of people or our dogs, and they appear to be making themselves comfortable in our pool. I'm just worried about the chlorine in the water being harmful to them, and, seeing as how they don't seem to want to leave, if I should start feeding/taking care of them. These do sound like Mallards. Although the chlorine and other pool may or may not harm ducks--I have heard differing answers--duck poop isn't good for you or your family. I would recommend that you float toys or inflatable rafts, etc. in the pool or use your pool cover. It is breeding season so they could be scoping out your yard for a nesting site. Especially if you do live near a lake or stream. I am reposting this with changes for privacy's sake. "Dear OC Birder Girl: I will soon be in Brea for a week but will have an entire day to bird in Orange County. I am mainly in search of Nuttall's Woodpecker (lifer). Can you help me with logistics? I would like to visit San Joaquin Wildlife Sanctuary, both Mason and Irvine Regional Parks. Where should I start? Thanks." 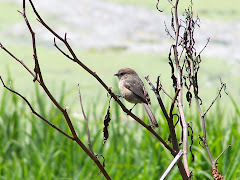 If you are staying in Brea, and you can squeeze in a weekday birding trip, you might consider Craig Regional Park which straddles Brea and Fullerton. http://www.ocparks.com/craigpark/ The Nuttall’s can be seen there as well. Now, for the weekend, the problem with Irvine Regional Park on a Sunday is noise and lots of people. Families barbequing, and the train whistle, the peacocks, the people biking and skating. The good news is that most of these people are not really early risers. You might consider birding there first to avoid the noise. If you get there between by 8AM you should be okay. The train starts at around 10:00AM. If you find the noise too much at Irvine, there is another quieter Regional Park nearby that you will also possibly find a Nuttall’s. Santiago Oaks Regional Park http://www.ocparks.com/santiagooaks/ is not far from Irvine Regional Park. (Exit Irvine Park, follow Irvine Park Rd as it turns into Jamboree. Turn right onto East Santiago Canyon Road. Right at Windes and follow to the park. ) ‎ The Regional Parks charge $3 during the week and $5 on weekends. Have plenty of dollar bills. (Be alert early in the morning at both Irvine Regional Park and Santiago Regional Park because there can be mountain lions and coyotes there early in the morning. Mountain Lions aren’t common, but Irvine Regional is listing the last Mountain Lion sighting as 04/30/2010.) If you were going to San Joaquin Wildlife Sanctuary, then you would get back on the 55 freeway and the 405 south. Exit at right at Jamboree and a quick left onto Michelson. The right lane on Michelson ends so get into the middle lane. Turn right on Riparian View. Follow the street past the Irvine Ranch Water District. Just before it dead ends, turn right and go down into the gravel covered parking lot and park. If there are no spaces, you can park along the dirt on Riparian View. Note that San Joaquin Wildlife Sanctuary has little shade. Make sure you have sunscreen and a hat. But since you are a birder, I am sure you will have both. From San Joaquin Wildlife Sanctuary, exit from Riparian Way to Michelson and turn right on Michelson. Turn right on Culver. Turn right University. Turn left into Mason Regional Park. Don’t know if you will have time for this, but if you do, another great place to see Nuttall’s is Huntington Central Park. http://www.huntingtonbeachca.gov/Residents/Parks_Facilities/parks/huntington_central_park/ Huntington Central park is over 350 acres. It is hard to miss seeing a woodpecker there. Not as noisy as Irvine Regional, but not the great oak woodlands either. You can see a 28 minute video about Huntington Central Park by copying and pasting the link above. The park is bordered by Slater, Gothard, and Ellis. Another great place to see Nuttall’s is Huntington Central Park. From Mason Regional Park, you would leave Mason, get on the 405 back and exit north on Brookhurst. Take Slater West (left) to Goldenwest. Good luck! Hope you find a Nuttall's Woodpecker! "Dear OC Birder Girl: Thanks for your speedy response and fantastic tips for my Orange County birding day. I truly appreciate your help. Take care...."
You're welcome. Have a great time birding in Orange County. Let us know if you see the Nuttall's. "Dear OC Birder Girl: Just wanted to follow-up and let you know that I had two lifers today, Nuttall's Woodpecker and Pacific-slope Flycatcher. Had a wonderful time on the Sea & Sage Audubon's walk in Santiago Oaks Regional Park. What a great park. Afterwards, I had a wonderful time at San Joaquin Wildlife Sanctuary. Thanks again for your help. Take care, Maria (Florida)"
You're welcome. Glad had a good time birding in Orange County. So glad you got *two* lifers. Have a wonderful trip home. Blessings. OC Birder Girl. Can you tell me any spots that are particularly good in November? I'm heading down to the area from Canada next week and only have a couple of days to check out the OC...any tips would be greatly appreciated! Do American Goldfinch frequent OC? It seemingly resembles the AGF's I've seen in North Dakota. This Spring I have seen this electric yellow specimen with dark coloration on it's crown and also on the primary/secondary feathers. It's somewhat larger than a Sparrow and yet smaller than a Mockingbird. I've seen it frequent the branches of trees (of course) and yesterday I watched it methodically search through the vines of my Tomato bushes (perhaps for tomato worms). I'm not an avid birder but being outdoors every day and I'm also very observant to my surroundings, this sighting does puzzle me. Any words you can provide would be most appreciated. Thanks. I live near a park w/a lake here in Riverside, CA. Coots are in numbers right now in our area. Oftentimes they are in need of medical attention. Do you know of a place that will take these birds in and help them to recover so that they can be released back into the wild. Hope those resources are of assistance. Thanks for stopping by, Bill. There are a lot of birds that could fit the small yellow-and-black-sparrow-sized birds description--mostly warblers. Townsend's, Wilson's, and Common Yellowthroat to name a few. You will also find American Goldfinches at that time of year. Noting the size of the bird as you did is important when you are trying to identify a bird. Also helpful to note are the bill. Is it black? Slender? Conical? Where on the bird are the colors? For example, a Common Yellowthroat has a black mask. A Wilson's Warbler has a little black cap. Where you saw it will also give you a clue. Birds moving quickly through the tree canopy picking things off the tree are almost surely warblers. Moving quickly through the bushes near water would probably be the Common Yellowthroat. Moving through the undergrowth and looking pretty small, Wilson's Warbler. Noticing these details is a habit birders pick up over time. 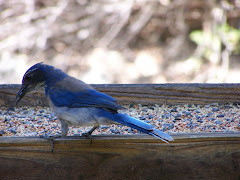 Now as far as the birds you see in Big Bear, there are several blue birds in that area that you might see. Three are bigger than you describe. That would be the the Scrub Jay, the Pinyon Jay, and the Steller's Jay. The smaller birds would most likely be Western Blue Birds and Mountain Blue Birds. Hope that helped. Have a happy new year, Bill, and thanks for your question. Bill, also a yellow-and-black bird that is larger in the OC is the Western Meadow Lark. They have a beautiful, flute-like song. I have a hanging "Nest" in my backyard tree in Huntington Beach (Springdale/Westminster Ave Area) Is this a bird's nest? I have pics of it. In Orange County, the most likely suspects are Bullock's Orioles and Hooded Orioles, but Bushtits also build hanging nests as do vireos. The oriole nests are high in the tree and hang down quite a bit. Other birds are lower in the tree and the nest is smaller. You will also find that House Finches can get rather messy in their nest building and the nesting material may hang down, but it is just a tangle of stuff hanging off the round classic nest. Check out some of these images of oriole nests https://www.google.com/search?q=hanging+nests+California&hl=en&prmd=imvns&source=lnms&tbm=isch&ei=vnvCT5zBPKjKiQLFsPiFCA&sa=X&oi=mode_link&ct=mode&cd=2&ved=0CFoQ_AUoAQ&biw=1024&bih=665#hl=en&tbm=isch&sa=1&q=orioles+hanging+nests+California&oq=orioles+hanging+nests+California&aq=f&aqi=&aql=&gs_l=img.12...42304.45942.2.48288.9.7.1.1.0.0.91.595.7.7.0...0.0.rBlbsOr9zXE&pbx=1&bav=on.2,or.r_gc.r_pw.r_cp.r_qf.,cf.osb&fp=c2df0586f4cea797&biw=1024&bih=665 Hope that helps. Thank you for stopping by. I am enjoying your blog very much! I am a new Californian. I have just started feeding hummingbirds. I have identified Anna's and Allen's and read all you have written about both species. What I don't know is about migratory species such as Rufous humming birds. I check the color of the back of the birds at my feeder(s) and have seen only ones with green backs, or Allen's. When might I expect to see Rufous hummingbirds? I also would like to identify Black Chinned hummers. When might I expect to see them? I live on the third floor of The Regency senior living community in Laguna Woods and hang the feeder(s) on my balcony. The hummers feed all day long and go through a prodigious amount of nectar! I love seeing them!!! I thought I saw what looked like white red-tailed hawks the other day. Do these exist in Orange County? I would suggest you look at my post Eagles and Hawks in Orange County, CA. There are white hawks or mostly white hawks in Orange County. Are they Red-tails? Probably not. The white hawks we have are Osprey, male Northern Harriers which are light gray but can appear white in various light, and White-tailed Kites. Albino or leucistic Red-tails occur in nature, but are rare genetic mutations. Osprey and very light phase Red-tails have dark markings on them as well. Extremely light phase Red-tails would still have the black bar on leading edge of the wings called the patagial bar and the "dark belly band" when viewed from below. Very light phase Red-tails appear do occur in the US, but are not very common in Orange County. White-tailed Kites are mostly white with a bit of black on the shoulders that does not stand out that much from below and a bit of darker shading around the eyes. It is the most frequently "pure white hawk" seen. Ferruginous Hawks are large and light in color, but not white. To know what you saw you would need to know details such as size, shape, markings if any, and behavior when observed. A lot more detail would have to be noted before a tentative identification could be made. Now if you are from Orange County, New York, there was a leucistic, or mostly white Red-tail seen there last week. However, I have not heard of any recent sightings of an albino or leucistic Red-tailed Hawk in Orange County, California. Where did you see the hawks? Re: white red-tailed hawks...I saw them in Fullerton, CA.....I looked at photos of white tailed kites...but these did not have the black on them. Same with the Osprey. My neighbor saw them also. These were all white. But, I think unless we see them again it is too difficult to identity them. However, from images we found on the internet, the closest match we both felt we had seen was the white red-tailed hawk. Neither of us is a birder though so maybe we just mis-identified them. They flew next to a brown, more typically colored red-tailed hawk and flew in a way very identical to the brown red-tailed hawks we see in out neighborhood very often. We will keep an eye out for them in case we see them again. I read how rare the white red-tailed hawk is so maybe it was not what we saw. Thank you very much for your reply. We live in San Clemente about a mile from the ocean up at the top of a hill - about 750 ft.
We are often visited by an owl who likes to sit on our chimney. His hooting wakes us up - but we love it. We don't know what kind ow owl he is, but about a month ago his hoots were echoed back by another higher pitched owl (possibly a mating call) . We'd like to build an owl house. Possibly up by the chimney. But we don't know the size or type of owl. We're afraid of scaring him away if we go out with flashlights. We just recently (today) had a Black Phoebe start building a nest on one of the eaves of our porch and my roommate, thinking it was the start of a mud wasps nest, took it down before I realized what he was doing and could stop him. It was just the very beginnings of the nest but she came back later this evening and looked like she was looking for where her nest had been. I'm completely heartbroken that I didn't catch my roommate in time. Do you think there's any chance that she'll start over. She's actually sleeping right now on the over-hang across from where she started the nest, so I'm hopeful she will. Just wanted to get a second opinion by someone a bit more experienced with birds. Thank you for your help. Hi OC Birder Girl - glad to find your site. We live in Irvine/Tustin area and have hummingbird feeders on our 3rd-floor balcony. Lots of Annas and most look very healthy. Occasionally we'll see an injured or ill one, or just have a question-are there any hummingbird "rescuers"/experts in the area? We don't know enough to catch and treat one, but would like to get help for them if they need it. For example, one had some string or something tied around it's foot, hanging down about 5 inches. Right now we have one whose feathers look more ruffled than usual, and looks like he's gulping, trying to swallow-head bobbing. Any idea why he'd behave like that? Regarding the Black Phoebe, it is hard to say if the phoebe will rebuild. If it feels it is a good enough place--and safe enough-- maybe. But if it feels dangerous, perhaps not. It is possible that a nesting shelf--like this one from Duncraft--may encourage phoebes to nest near you home in the future. Valerie, I would recommend that you call Wetlands and Wildlife Care Center in Huntington Beach (714) 374-5587. Here is their website. http://www.wwccoc.org/. Dear OCBG: I will be in Laguna Beach in early August, and there are 2 species I'd like to see and photograph: Allen's hummingbirds and black skimmers. Do you have any suggestions on where I could find them? For Black Skimmers, I suggest either Bolsa Chica. Stand on the footbridge off the PCH parking lot, turn to your right, and watch for them skimming along the edge of the marsh toward the bridge. Also you can get some good shots by going to the Upper Newport Bay parking lot. Park, walk in the direction you will be going when you leave the parking lot. On the left where the runoff enters the water is an area where Black Skimmers often rest. Allen's Hummingbirds are easily seen at San Joaquin Wildlife Sanctuary near the Audubon House, and throughout the sanctuary. Also, Huntington Central Park in Huntington Beach--especially in Shipley Nature Center which is in the west side of the park. We also have lots of Anna's Hummingbirds. Good luck. Hope you see those two and lots more. Thanks for stopping by. That one is open to the public for a small charge of $3. And you can eat lunch there, too. For Allan's hummingbirds, the Environmental Nature Center in Newport Beach is also good. About a year ago, you posted that no confirmed California condor sighting had been made in Orange County. Is that still accurate? Chris, to my knowledge, that would still be the case. I have seen no sightings posted. Not even a maybe since the 2012 unconfirmed sightings. You can always double check with Sea and Sage Audubon to be sure. However, the birding community has been silent as to sightings of a California Condor which leads me to believe there have been none since a California Condor would be BIG news. Thanks for stopping by, Chris. I spotted a huge bird of prey with a kill in the heart of the JW airport business area. Luckily I took a photo, but I cannot tell if its a small golden eagle or a incredibly large red tail hawk. Is there a way to submit photos to you so you can help me ID the bird? She stand almost 24 inches tall, but has a white breast and a classic red tail. thanks! The bird you describe sounds like a Red-tailed Hawk. You can post the picture to my Facebook. The link is on the side of my blog. The first link on the right. Or send me a FB message. Then I could tell you for sure. I jog at a soccer field in San Juan Capistrano which is separated from an adjacent organic farm by a long hedge. For the past 2 weeks I have been observing a lone flycatcher diving from the hedge to hover a few feet off the ground over clover, dropping down to catch bees, I assume. I've been trying hard to get close enough with my binocs to identify it. I'm pretty convinced it is an Eastern Phoebe but have never seen one around here or knew them to visit our area. Have you received any similar reports? Hi Birder Girl! At Blue Gum Park in Irvine, we have four small hawks or falcons. Sorry if I totally offend birders by my lack of any knowledge! I was surprised to see four hanging out for many days together. I have never seen birds of prey like this in the wild, and I was also trying to identify them. The closest guess (based on ZERO bird watching experience) is a Merlin. Perhaps two were darker, maybe Peregrine. Or do they hang out as families - two adults and two juveniles? Even any guesses would teach me a lot to share with my kids. Good morning! Firstly, I have really enjoyed your blog. The information is fantastic and your knowledge is quite extensive. Secondly, my boyfriend has lived in Eastside Costa Mesa almost his entire life and recalls a pond (affectionately dubbed "Duck Pond") that he and his family frequented when he was a kid. We have scoured your site, Googled, driving trips to find this little gem. According to Patrick, there were mallards (which may not help) and it was definitely near Irvine Avenue. If you recall this pond/park, it would be fantastic to know the name so I can finally end his search for the Duck Pond! Thanks for stopping by, Angi. The closest park matching Patrick's description is Tewinkle Park which is on 970 Arlington Dr.
Hi - I am in Newport Beach. A few moments ago, a rather large brown bird with a medium-thick, good-sized bill and the proportions of a road runner (tail length to body) was spotted by me on someone's chimney. It is not a road runner, of course - but that is the proportion. It was making an unusual clicking sound, combined with a "hoot" that sounded owl-like (though not an owl). It was so unusual that I have recorded the sound and got a distant picture, too. My curiosity is getting the best of me and would like to know what type of bird this is. It was about a foot tall and the tail was approximately 9 inches long. It had a relatively slender body. Well, Barbara, what you are describing sounds like a roadrunner. There are roadrunners in Orange County in Newport Beach so it could be. And they sound very like doves or owls. 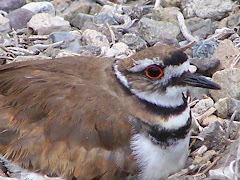 Here is a video by Don Des Jardin of a Greater Road Runner calling. https://www.youtube.com/watch?v=vcPdBFin5oo And here is another video with a bit of clicking https://www.youtube.com/watch?v=2puQ-yC6rIw They do click their bill together. I have heard one in Peter's Canyon that was louder than this one and like a sounding like a large dove. Greater Roadrunners are all over Orange County including Corona Del Mar and areas of Newport and so it could be. Check it out and see if this is your bird. Thanks for stopping by, Barbara. Thank you very much for responding to my query. I never expected to see a roadrunner atop a two-story house near the ocean, however, your video with the clicking sounds made it clear that is exactly what I saw. This may sound unusual (and it is); however, two years ago, a white snowy owl (huge) swooped down through our back yard in Newport Beach. I quickly went to the Internet to learn that, while unusual in this part of the country, there have been a few sightings in Orange County. I'm still kicking myself that I did not get a picture. Roadrunners actually run down the boardwalk by the ocean at Crystal Cove. I have not seen it, but a ranger told me he sees it all the time in the Spring. A picture of a Snowy Owl in this area would have been awesome. They are extremely rare this far South. Hope you see your Roadrunner again. Thanks for sharing your experience with us. Just wondering if you have had a chance to see the new broods of Ridgeway Rails at Bolsa Chica? also, have you heard of any at the Back Bay or elsewhere this year? Are they a CA only bird? I saw the former Clapper Rail now Ridgway's Rail family including parents and 7 babies at Bolsa Chica just this weekend. Very cute. I am not aware of any others. However, there may be others. Our apartment faces the Back Bay. We have a 12 pound dog and are concerned about the hawks, they have flown 4 ft from our balcony. Is there something we can do to deter the hawks and/or any other bird of prey? There is nothing you can do to keeps birds of prey away from your backyard. Endangering them in any way could be a violation of federal law. A 12 pound dog should be closely monitored outside where there are raptors(hawks and owls). You can try to put in an outdoor run that has a top. The biggest risks are from Red-tailed Hawks, Great-horned Owls, but the biggest risk is from coyotes.Never allow your dog outside alone day or night. Never allow your dog to chase coyotes because they will attack your dog. A coyote attacked a pit bull. Coyotes are all over Orange County from residential areas adjacent to wilderness areas to urban areas like Fountain Valley. Seal Beach, Irvine and Tustin have had numerous incidents with coyotes. Coyotes are commonly spotted in those areas and Huntington Beach, Fountain Valley, Fullerton, Ladera Ranch, Laguna Woods, Laguna Beach, Mission Viejo, Anaheim, and Costa Mesa. Red-tailed Hawks and Great-horned Owls can be found in almost every area of Orange County--you are just more aware of the risk. A dog that size is not safe in most backyards in Orange County. Newport and Upper Newport Bay aka the Back Bay are areas of lots of Coyote activity. Remember coyotes can run fast and jump fences up to 8 feet tall. What kind of Hawks frequent Huntington Beach? Are they large enough to kill cats? Will be visiting OC next week for some bird photography. Planning on going to Bolsa Chica and Newport Backbay looking for Black Skimmers, Brown Pelicans (flight shots), and Avocets as well as the regular resident birds. Which spots for these would be best this time of the year ? Also, my other main interest is the wild Parrots in the OC area. Irvine Regional Park seems to be a good place, but could you recommend any local spots that they can be found reliably now. I will only have three days and hate to waste much time driving all over. I live in Honolulu and you can see my local bird photos at www.cheekybirdphotos.com. Jerry, Bolsa Chica and Newport Backbay are both good places for the birds you are looking for although it might be a bit early for some. Newport Backbay aka Upper Newport Bay has many of the birds you are looking for. If you park in the parking lot and walk in the same direction you would drive, you will come to an area where the water from the neighborhood drains into Upper Newport Bay. Oftentimes the Black Skimmers hang out there. Also--although harder to find--Black Skimmers and both Brown and American White Pelicans can be found at San Joaquin Wildlife Sanctuary in Irvine not far from Upper Newport Bay. A great place to take pictures of Black Skimmers at Bolsa Chica is on the bridge because they fly along that waterway and fly over the bridge to continue their foraging. Brown Pelicans are all over Upper Newport Bay, but at Bolsa Chica you can get closer to greater numbers of Brown Pelicans, and they even hunt near the bridge on Pacific Coast Highway giving opportunity for some spectacular shots. Great shots of shorebirds can be had at many location including Upper Newport Bay, Bolsa Chica, and at San Joaquin Wildlife Sanctuary. You can get some great shots in the first pond at San Joaquin Wildlife Sanctuary of American Avocets and Black-necked Stilts. Also small wetlands along PCH have been developed and are in process of being developed and also are attracting wildlife. Thank you. Gook luck with your report.